While I've mostly been utilizing Audible to enjoy various autobiographies read by the authors / persons of focus themselves, I've slowly started to venture into trying out various works of fictions. Anthology series seem to work best given how I tend to use Audible during my walks to and from work and thus I got into this particular gem. Doctor Who: The Tenth Doctor Adventures - 10th Doctor Audio Originals is one such collection of short stories as read by various stars of thes show including David Tennant, the Tenth Doctor himself. Now these are still treated as more traditional audio books and not full-blown audio dramatizations like what you get from Big Finish. But they're still quite compelling for a variety of reasons. 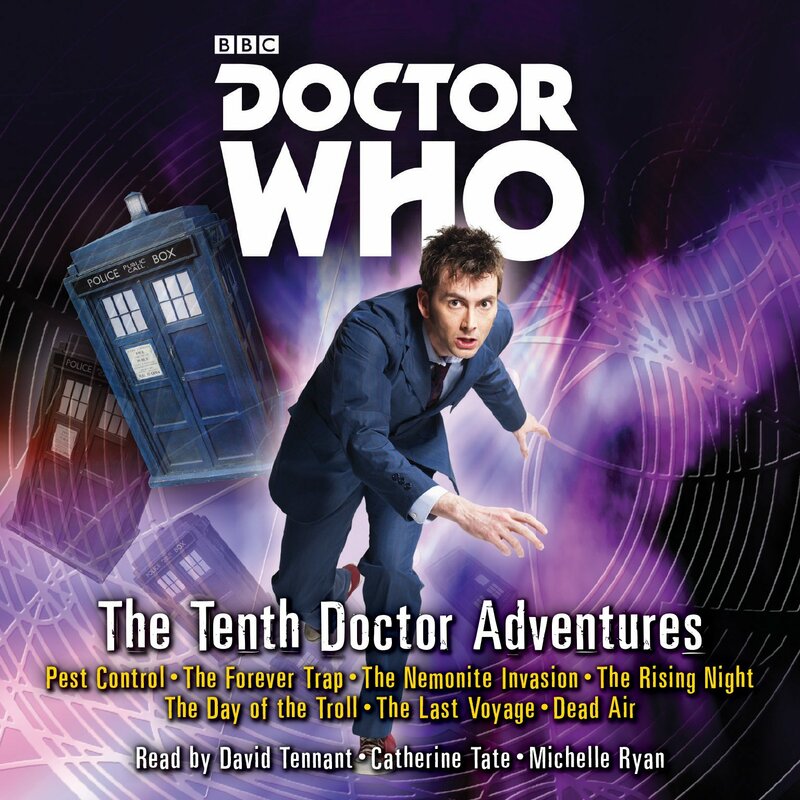 Synopsis: Doctor Who: The Tenth Doctor Adventures - 10th Doctor Audio Originals is a collection of 7 short stories by various authors. The audio book edition (such as this Audible distributed release) is read by David Tennant, Cathering Tate, and Michelle Ryan. Things start out strong with the Doctor and Donna landing in the middle of a war in Pest Control (by Peter Anghelides). Then there's The Forever Trap (by Dan Abnett) which has the Doctor and Donna becoming unwilling residents in a different sort of condominium. The Nemonite Invasion (by David Roden) involes disguised invaders among the soldiers of World War II. The Rising Night (by Scott Handcock) is a far-flung tale set in the 18th Century. The Day of the Troll (by Simon Messingham) focuses on an isolated community of humans being hunted by a creture of nightmare. The Last Voyage (by Dan Abnett) has the Doctor ending up on the maiden voyage of a space cruiser powered by a highly advanced drive system. And finally Dead Air (by James Goss) is a bit of a meta adventure presented as a sound of found audio recording of the Doctor. What I Liked: As much as I love full audio dramatizations, there's something to be said about these stories read by members of the cast. Sure, they bring their respective characters to life just as you'd expect them too. But when it comes to reading the parts of other chaaracters, that's when it gets really interesting. Listen out for how David Tennant impersonates Donna Noble in the stories that he readsa and the same goes for how Catherine Tate imitates the Tenth Doctor. It's hilarious on its own! And the stories are all pretty solid for the most part. I particularly like the clever twist to things in The Forever Trap and the subtle creepiness of Dead Air. And they particular play out even better as audio experiences, especially when narrated by Daivd Tnnant. There's just something about his speaking tone that naturally supports storytelling, just like how I can never get tired of hearing his warning speech in the episode Blink. What Could Have Been Better: Michelle Ryan wasn't quite the most engaging reader or maybe her softer, sometimes more sultry tones were a little harder to focus on at times. It probably didn't help that one of the stories she raid was set in the somewhat more mundane Victorian England. I know she only read the one book, but it really lingered. As with any anthology, some stories will be more engaging than others no matter who reads them. Both The Rising Night and The Nemonite Invasion weren't quite my favorites in this set as they had somewhat dragging middle bits that took a while to get to the end. But at least this venture gave me a whole new appreciation for Dan Abnett. TL;DR: Doctor Who The Tenth Doctor Adventures - 10th Doctor Audio Originals is a great collection of fun, new adventures for the Tenth Doctor and Donna across all of space and time. With the mix of authors and narrators you're bound to find something you like. Thus the audio book gets a full 5 moments of the Doctor being so brilliant he surprises himself out of 5.